Ethiopiaid has focused on supporting projects that prevent and treat people living with facial disfigurement and Noma, a gangrenous infection affecting the face. We support projects that prevent and treat people with Noma, an acute and ravaging gangrenous infection affecting the face. Predominantly, it attacks children whose immune systems have been weakened by disease and malnutrition. The infection starts in the mouth and spreads rapidly, leaving ghastly, painful wounds on the victims' faces. The demand for highly skilled medical professionals in Ethiopia is great. We are working with an Facing Africa to send teams of medical volunteers to Ethiopia, to perform reconstructive surgery on people who have been tragically disfigured by Noma. All the healthcare professionals that are sent are unpaid volunteers, generously donating their time and skills. Facing Africa also create learning and training opportunities for local health professionals in order to improve surgical capacity and nursing in Ethiopia. A pilot nurse training project was introduced, run by two experienced Irish nurses, and anaesthetists and surgeons were also trained. Facing Africa also run outreach missions in order to find patients in remote, rural areas. Former patients acted as ambassadors and raised awareness in their communities to help encourage new potential patients to come forward and receive surgery. As a result of this intervention, children are now able to eat, speak, and breathe properly again. Children can return to school with a new sense of confidence. Project Harar - NEW PARTNER! 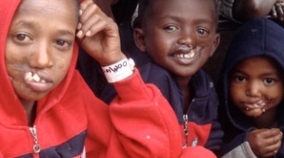 Project Harar’s vision is a world where no one lives a disadvantaged life because of a facial disfigurement. The organisation acts as a bridge to professional medical care for the 85% living in rural poverty. They aim to provide treatment and rehabilitation for African children and young people with facial deformities, as well as supporting their socio-economic integration in society. This ensures they can live a life of dignity, within their communities. Year round, they provide access to cleft surgeries, predominantly for children, who would otherwise be denied either due to financial constrictions, or simply because they are not aware that the surgery is available. Project Harar also run an annual mission to provide surgery for complex cases of facial disfigurement. To date, Facing Africa have performed over 400 transformative surgical procedures on children with facial disfiguration caused by Noma. Facial reconstruction surgery was carried out on 32 patients during the October 2016 mission. 60 patients and their guardians were transported to a rehabilitation centre to be emotionally and physically prepared for surgery. 42 of those patients were deemed fit enough to receive surgery and went on to benefit from rehabilitation and post-operative care. In 2016, our donors helped 60 children have facial reconstruction surgery, curing them from Noma, removing tumours, and repairing hyena bit injuries.